Being the total single pringle that I am, I thought i'd share the kind of post i'd like to be reading on Valentines, one that's aimed towards us singles on how to absolutely own Valentines without all the soppy crap that comes with the day itself! For me Valentines isn't all doom and gloom, as i'm not that scrooge type of person but being single definitely makes you have some detest towards those who are loved up, mainly because I wish I had someone special to spend the day with. However I think it's amazing that we have a day to celebrate love, and not just loving a partner but a family member or your closest girlfriends, whoever or whatever it may be, here are a few ways you can enjoy Valentines if you're a singleton like myself. Grab a takeaway with your closest gal pals - One thing I've never done on Valentines is spend it with my friends, however with a good majority of my girls recently joining the single club, the idea of us all joining together to celebrate our amazing friendship sounds pretty good to me! With Valentines falling on a weekday this year, devouring a takeaway with a glass of wine and giggling the evening away sounds so much more appealing than paying those Valentines day restaurant prices. Treat yourself to a pamper evening - One way that always brightens my mood and just refreshes my mind is to have a little pamper session! I've recently been loving a piping hot bath, with all the candles and my YouTube subscription box set up and ready to wind down of evening. Some recent favourite bath products of mine are from a really cute Etsy shop, Heartn'Soul who handcraft their own bath and body products from natural ingredients. A few favourites of mine include their Lavender Bath Bomb* (£3.28), which as the name would suggest is infused with organic lavender oil and this is divine after a long day where you need a bath bomb that is going to help you relax. Another has got to be their Vanilla Oatmeal Honey Soap* (£4.93) which comes shaped like a heart which I just find adorable, and i've been loving this to use as a hand soap but it's also really nourishing to use on your body also. 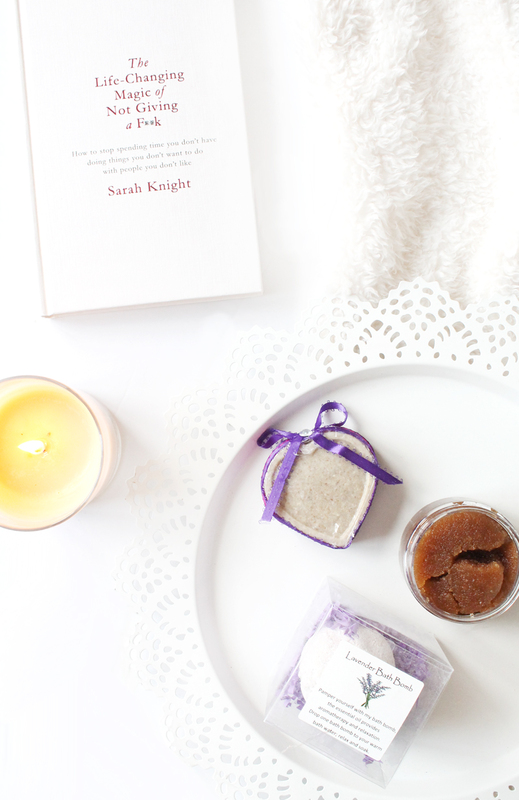 Finally the last product is their Organic Sugar Scrub* (£4.10), and if you're like me when it comes to sugar scrubs then you too will love this! Get lost in a new read - Reading is something that I don't do regularly enough, but it's something I want to get more into, as I remember the days of when i'd get completely lost in a book, and hours would go by, and I honestly miss that. To help me get back into reading I recently purchased The Life Changing Magic of Not Giving a F*ck (£9.99) from SO many bloggers raving over this book, so I just had to see what it's all about. In all honesty i've not started this book, but if you're a massive lover of books then what else is there better to do than start a new book from your never ending pile! Visit a family member - As I mentioned i'll be spending my Valentines no doubt celebrating my nan's birthday, but what is also so caring is spending that day with a family member that you love dearly. Whether it be your Mum or your grandparents who you haven't seen in a while, devote part of the day to seeing them and spending some quality time with them. Kick back with a chilled movie night - Whether it be going to the cinema with your gals for the release of Fifty Shades Darker, or having a film fest on your own with a cheap bag of popcorn from B&M and your favourite film or box set. Give yourself some chill time to just sit and do f-all, and let the hours pass by!